I am back in the quaint town of San Miguel and with the new owner of estanco Can Xico de Sa Torre, Tita Planells. Tita is an Ibicenc woman through and through, born and bred here on the white island and, as far back as she can remember, the Estanco has been a part of her life. As a child, she would run up and down the stairs to the rustic upper part of this typically payes house where, to this day, her parents still live. Nowadays, Tita does a lot more than just run up and down the stairs since she has recently started managing the business. She tells of how her family has been in charge of this social epicenter for generations. Still unchanged are the130 year-old chairs, the floor, the bar, the thick salted walls (cal) and the earthy wooden smell that she remembers so distinctly from childhood. We breathe in the smell and Tita begins to reminisce with a smile about the past 100 years of the Estanco. What purpose did Can Xico serve 100 years back? She begins, “Can you imagine that it started off as a post office for the village, a place where my grandfather used to serve as an intermediary between illiterate Ibicenc women who wished to send letters to their men (who had migrated to Latin American countries for work purposes)”. Yes, this is the kind of place where I can imagine these women peering over the dark wooden bar to pick up their mail with Tita’s grandfather recording it all on paper with a quill. When did Can Xico start to change into what it is today? “I think it really started to shift in the 1970s when the mass influx of hippies from abroad arrived on the island. They transformed the Estanco into a kind of money depot.” She continues “ in the midst of the Vietnam era these wealthy foreigners had discovered Ibiza and would wait for their money packages within the safe walls of Can Xico”. Tita explains how “ a hundred years on, the Estanco is the only bar at the top of the hill that remains in a pueblo that had originally consisted of just a few payes houses, a market and what was then a triad of bars at the church level”. Clearly the horse carriages are gone (mind you, on a festival day, it is quite common to still see these passing in front!) but the Estanco remains as a kind of second home for so many locals, as a village institution. What would you say defines Can Xico? Have you always known that you would one day be the owner of Can Xico? “ Obviously I am very emotionally attached to the Estanco and to the village of San Miguel so I have always been confident that I would be connected with both. I’m not sure I knew that I would ever own it since I had left Ibiza for a time and my sister has until now been running it successfully for over ten years”. Tita explains how she did in fact leave Ibiza when she was 18 years old only to spend 18 years away in Madrid working as a model and an actress in a television series. What prompted you to come back to Ibiza after being away for so long? Did you move back into San Miguvel upon your return? How do you think your experiences working as a model and an actress have shaped you for your current responsibilities at Can Xico? What do you typically do after work? Do you have a favorite place to eat nearby? 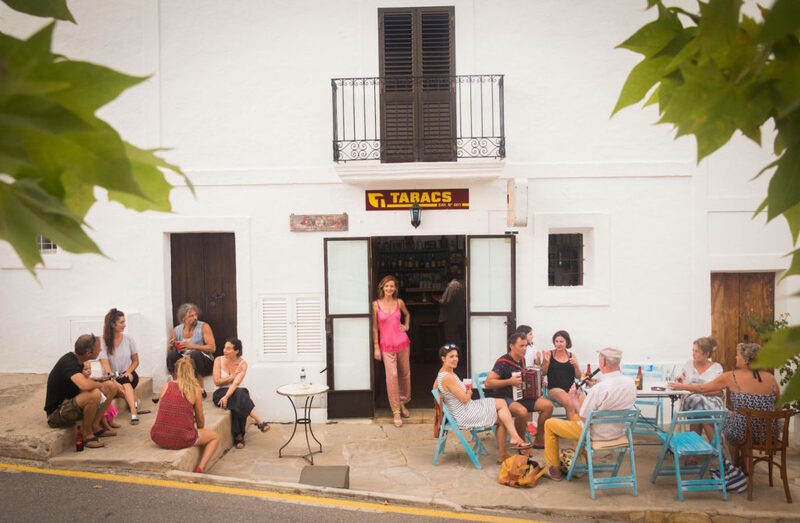 All this talk of food is making me hungry and I suggest we go sample Chiringuito Pascual. I go outside and stare out at the rolling green landscape and the statue of Maria Villangomez (1913-2002), one of Ibiza’s most prolific writers. I slowly finish my wine and feel some moments of quiet reflection set in. Getting to Can Xico: follow the road through San Miguel and then the church signs all the way up the hill.